This premier Four Star campground is located directly on the beautiful Bay of Fundy in the settlement of Parkers Cove, Nova Scotia. Offering a west facing coastal location with unspoiled views and a pristine, quiet environment, the property is just 10 minutes outside the town of Annapolis Royal - providing easy access to shopping, services and entertainment. The 14 acre park includes one quarter mile of oceanfront shoreline with two cobble beaches, playground, playing fields, outdoor heated swimming pool and five buildings. The buildings house the Reception Center, office, store, pool change rooms, recreation hall, laundry facilities, washrooms, garage, and storage barn. This premium camping establishment features 28 individual tent sites nestled in a secluded waterfront section of the property, and 62 level full service RV sites arranged on two terraces overlooking the bay. The grounds, buildings and infrastructure of the facility are high quality and well maintained. 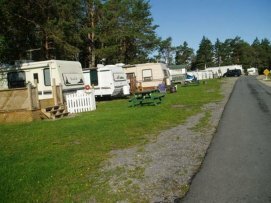 A returning spot for visitors, only a handful of campgrounds in Atlantic Canada can boast this type of layout and quality, and they are all provincially or federally owned. This is an opportunity to lease or purchase an ideal waterfront lifestyle business. Lease to purchase options may be explored, and owner financing for a share sale of this valuable oceanfront real estate is available to a well qualified buyer with a minimum of 50% down. Welcome to Administrative Law, a shared, online source of regulatory code information, maintained by enthusiasts and experts around the world. Join us and be a part of building and improving it!